Fiji is a group of about 844 islands, of which 106 are inhabited, in the South Pacific east of Vauatu. It became independent in 1970. The map shows the largest islands, including Viti Levu where the capital, Suva, is located. 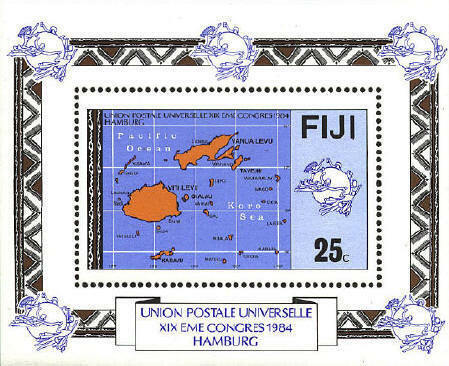 The stamp issued by Fiji in 1977 shows a simplified map of the islands in shaded relief. Only the capital of Fiji, Suva, is identified.